If your tub isn’t draining properly, it can be a real pain. If your tub isn’t draining properly, it can be a real pain. Any number of things can cause the drain to slow down, like loose hair and even bath salts. 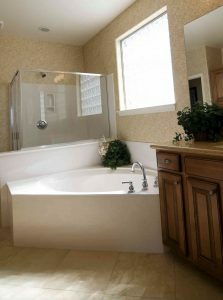 No matter what is causing your slow tub drain, you will want to get it fixed as soon as you can, to avoid more inconvenience or even a worse problem. Remember back in elementary school science class when the teacher added baking soda to a beaker of vinegar and used it to blow up a balloon? Well, that same combo can help you clear a slow drain. The bubbles created by the chemical reaction scour and scrub whatever they touch, so your drain can be cleared without horrible smells or corrosive chemicals. Start by measuring one cup of white vinegar and one cup of baking soda. For a little extra scrubbing power, you can also add a cup of salt. Make sure there’s no water in your tub then dump the baking soda and salt down the drain, followed by the vinegar. You should see quite a bit of frothing, which signals that your ingredients are doing their job. Let it bubble for around 10 minutes, while you bring a pot of water to a boil. Pour the boiling water down the drain and then it should be okay. Another way to cure a slow tub drain is to use a plumbing snake. A plumbing snake is a long piece of thick metal wire with a spike on the end that can be rotated, either electronically or manually with a handle on the end of the snake. It is a relatively inexpensive piece of equipment that can save you a lot of headaches. This entry was posted on Friday, January 26th, 2018 at 6:58 pm. Both comments and pings are currently closed.